Jacob Gunnarson’s first reaction upon being handed the keys to the observatory was one of moderate horror. Gunnarson ’17 had been working with Robert Vold, the director of William & Mary’s Thomas Harriot Observatory atop Small Hall. After some training, Vold mentioned that he was due to retire, and then asked Gunnarson — a sophomore at the time — if he was confident enough to use the observatory on his own. Horror and intimidation gave way to confidence and competence to the degree that Gunnarson and another student, Alexandra Cramer ’18, began using the observatory to make photographs of the moon, planets and nebulae. In mid-September, the two were moving ahead on preparations to collaborate with an astronomer on a project to log asteroid impacts on the two biggest planets in our solar system. The telescope and mount were installed in the observatory in early 2012, among the last upgrades that were part of a massive remodeling and expansion of Small Hall, the physics building which carries the name of Thomas Jefferson’s science tutor at William & Mary. The mount is computer-controlled, as are the dome and digital camera. But even computer-controlled astronomy requires a fair amount of hands-on maintenance and plain old common sense. For instance, Gunnarson could use the computer to select a photographic filter from an extensive array installed in a turntable inside the telescope camera — if he only knew what command selected what filter. Cramer and Gunnarson spent much of the summer in the Harriott observatory, learning the system and doing maintenance chores. One evening, the mount began beeping and Gunnarson had to adjust the counterweights that keep the instrument in balance. “I just read the manual,” he shrugged. 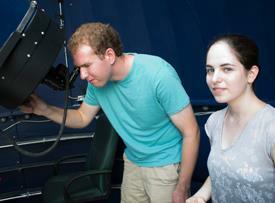 The two students began taking photographs with the observatory’s camera, getting results that impressed scientists at William & Mary and beyond. Deconinck sent one of the student’s photos to the team of the New Horizons space probe. “Jacob had taken a photo of Pluto right when New Horizons flew by Pluto. It was a great picture and they were impressed,” Deconinck said. The photographic results were so impressive that Deconinck is working with the two students in a collaboration with astronomer Kunio Sayanagi, at Hampton University, to study asteroid strikes on Saturn and Jupiter. It’s work with real world impact — literally. “Jupiter has a reputation of being kind of the vacuum cleaner of the solar system,” Deconinck said. He explained that the Jovian planet, with a mass more than twice that of all the other planets combined, has a gravitational eminence that attracts debris heading in from outer space. Cramer added that without Jupiter (and, to a lesser extent, the other large planets in the outer solar system), acting as shields, more sun-bound objects would find their way into the inner solar system, where Earth is. Cramer is taking the lead on the collaboration, which will use the observatory to quantify asteroid strikes on the two large planets. Asteroids are too small and too far from Earth to make direct observation possible, she said, but a tally of asteroid strikes on Jupiter would make an excellent basis for computing a model of the total asteroid population expected to be headed our way. Gunnarson said the group is in a kind of trial phase to see if the asteroid-impact observations are possible. The collaborators need three things to make it all work. First, they need a video camera to capture the flash or other evidence of an asteroid impact on the surface of Jupiter. In addition to a clear night, Cramer said that it’s helpful for the object to be studied be in an optimum location. “You want to see that it’s high up in the sky, because there is less atmosphere,” she explained. The third requirement, and the trickiest one, is time. Their video observations of Jupiter will take six to eight hours each. It becomes tricky because of the construction of the observatory. The hemispherical dome rotates on the stationary base of the observatory. Cramer explained that access requires the shutter in the observatory dome to be aligned with the bottom of the doorway, in the base of the observatory. Unless the planetary alignments are perfect, the shutter and the door are not — and anyone inside the observatory is inside the observatory for the duration of the observation. “There is a way to operate this thing remotely,” Gunnarson said, “but…” He shakes his head, leaving the sentence unfinished. The Physics Department plans to expand the use of the 14-inch Meade telescope in the Thomas Harriot Observatory. Dayle Hancock, director of the department’s teaching laboratories and Professor Keith A. Griffioen note that demand for undergraduate research projects in astrophysics is growing, and the department plans to increase the use of the observatory by adding the capability of transmitting real-time images from the CCD camera attached to the Meade telescope into classrooms in Small Hall.